Amid a landscape of wrinkling badlands and mysterious spires, Shakespeare Arch is the only significant natural arch in Utah’s Kodachrome Basin State Park. 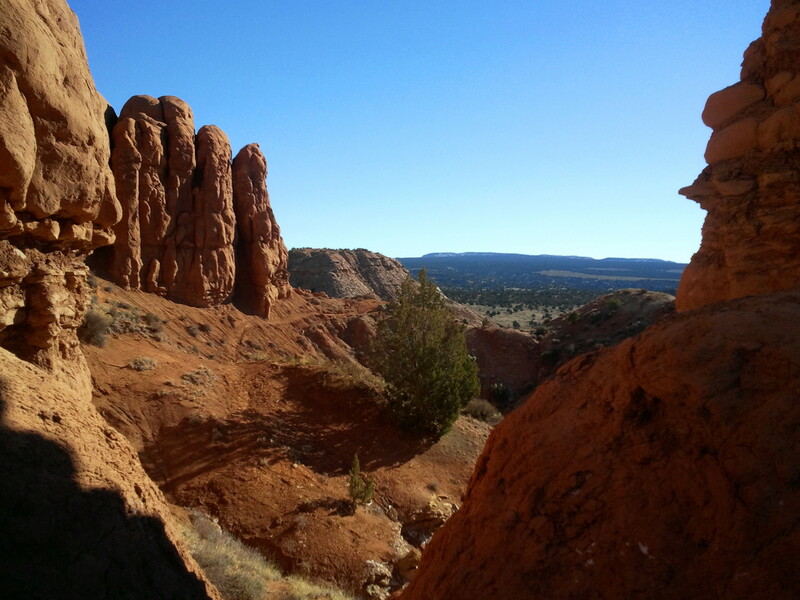 The loop hike described here offers a short, pleasant walk out to the hidden arch, accented by panoramic views of the surrounding area, including the Pink Cliffs of Bryce Canyon National Park and the northwestern reaches of 1.9 million-acre Grand Staircase-Escalante National Monument. It is also a good place to spot streaks of white gypsum, found scattered within the sedimentary layer known as the Carmel formation. To reach the Shakespeare Arch Trailhead, turn right onto a well-graded gravel road just north of the Kodachrome Basin Visitor Center. 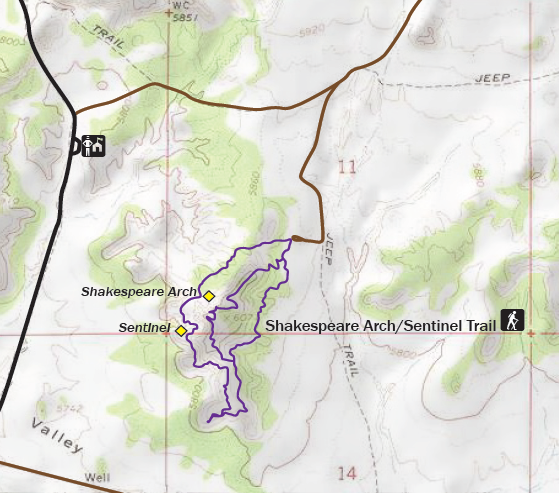 Follow this route out of the pinyon-juniper forest and across open grasslands for 0.8 miles; turn right at the sign indicating “Shakespeare Arch.” From here it is another 0.7 miles south to the trailhead. Two wide, sandy paths take off from the trailhead; stay to the right for the quickest access to Shakespeare Arch (loop hikers will return via the left path). The trail gradually dips in and out of a series of washes, passing a number of nice viewpoints affording nice vistas off to the north and west. To the east, the west-facing cliffs of a 200-foot glob of orange Entrada sandstone dominate the scene (the loop completes a circle around this butte). At roughly 0.2 miles, there is a fence and a cattle gate—when I was here in January 2015, the gate was closed—but easily unlatched. From here it is a couple minutes’ walk to Shakespeare Arch, tucked away in a shady cove high up the cliff walls. 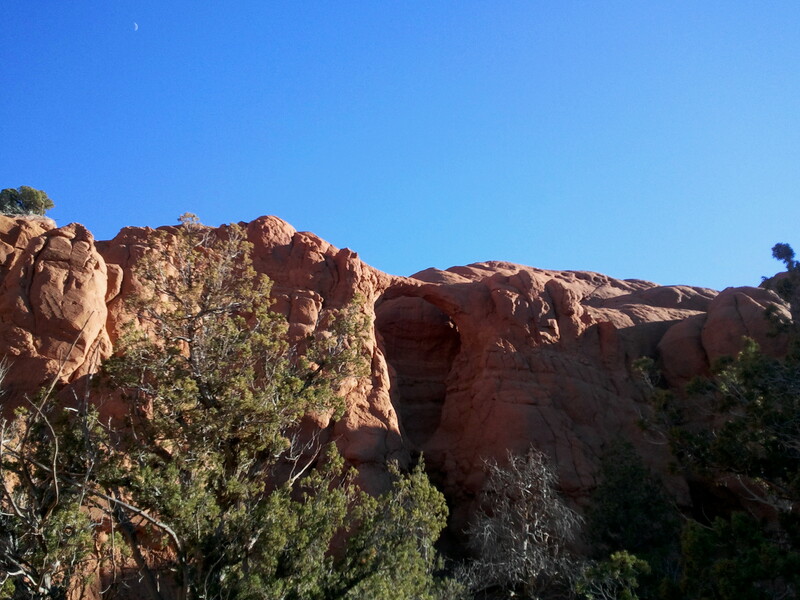 A short spur leads to the best viewpoint of the arch. Many hikers will turn around here to return to the parking lot. 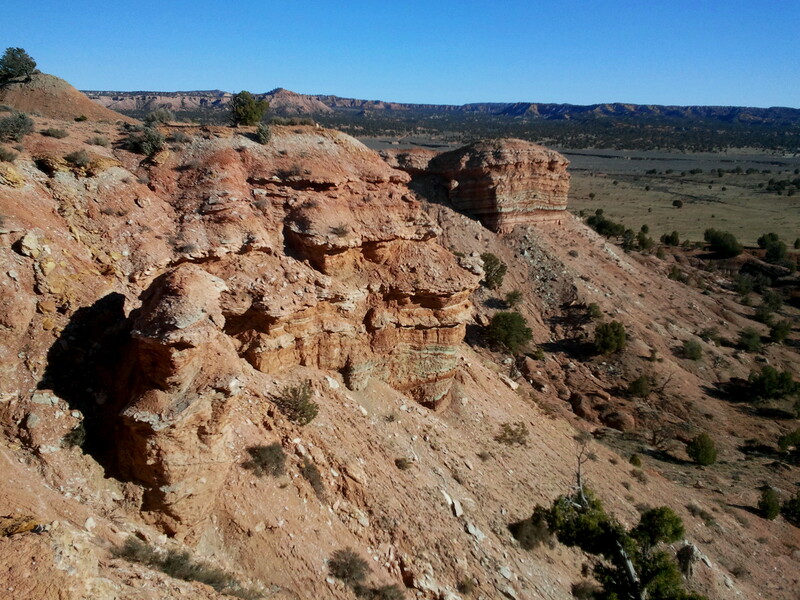 But the best views lay ahead, as the trail winds southwest toward the Sentinel, around the corner from the arch. 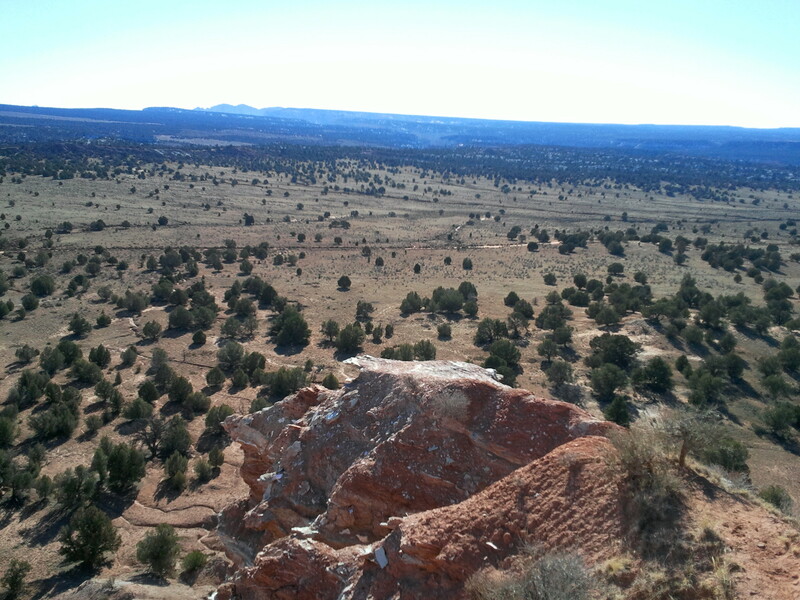 The tan-white hue of this towering pinnacle produces a stark contrast with the backdrop of red-orange Entrada bluffs. The Sentinel is an example of a “sedimentary pipe,” a geological feature unique to this area (Kodachrome Basin has 67 documented pipes). 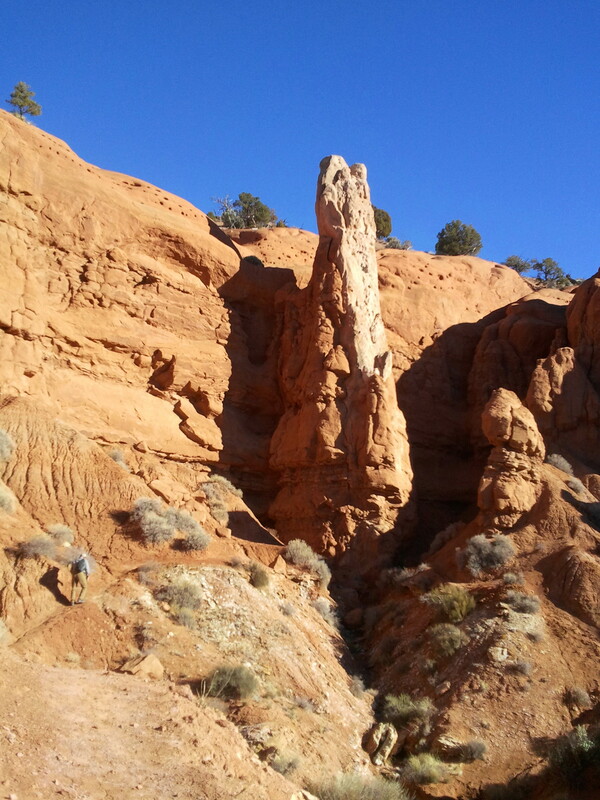 Though still a mystery, the prevailing theory suggests that these off-white spires were formed by underground water slurries, which forced up and hardened sediment over time; surrounding Entrada rock then eroded away, revealing tall chimneys most likely composed of rock from the underlying Carmel. Beyond the Sentinel, continue the counterclockwise circuit around the Entrada mass, passing up and over a shady cut in the lofty orange walls. The trail beyond carefully traverses the eroding hillside, at times tilting sideways down the slope itself. Rounding another bend, an arch-in-the-making appears off to the left. 5-10 minutes beyond the Sentinel, the footpath veers due south, leaving the sandstone cliffs behind as the trail climbs out to a scenic viewpoint at the end of a ridge. Follow a short spur to the overlook, which affords a 270-degree view to the west, south, and east. Flatlands below give way to chalky bluffs and deep-cutting canyons—the principal features of Utah’s vast Grand Staircase. Upon returning to the main trail, one of the first things you’ll notice are the south-facing cliffs of the Carmel formation, composed of alternating layers of pink, gray, gold, and forest green. Speckling the landscape are also streaks of white: this is gypsum, a chalky mineral often used for drywall or fertilizer. The loop trail follows the ridgeline north for 0.2 miles through the Carmel to a trail junction, where hikers are given the opportunity to embark on a more challenging route back to the trailhead: a 0.3-mile scramble over the “slickrock cut-off.” A short walk up the trail reveals a taste of what’s to come: a trail arrow pointing up a 12-foot friction climb. A tiny crack affords a foothold, the first of many obstacles along the way. Most hikers will stick with the milder route, which continues right at the trail fork and bypasses the slickrock on the right. It is 0.4 miles through pinyons, junipers, and Mormon tea plants from the fork to the trailhead. 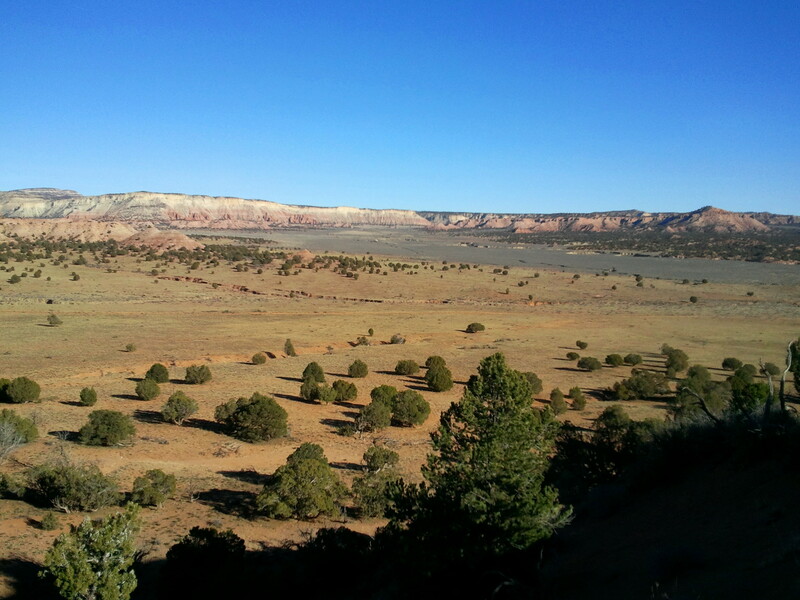 Sweeping views to the east feature the Cockscomb and Gray Cliffs, roughly marking the western edge of Grand Staircase-Escalante’s vast Kaiparowits Plateau. 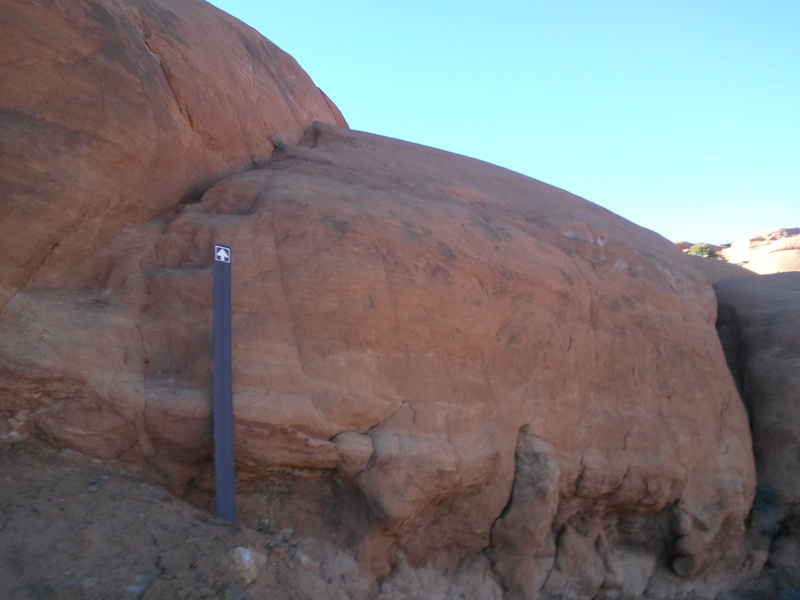 50 yards from the trailhead, the loop meets up with the northern end of the slickrock cut-off. From here it is an easy, gradual descent down a hillside back to the parking area. Allot around an hour for the entire loop—slightly more if planning on taking the slickrock route. 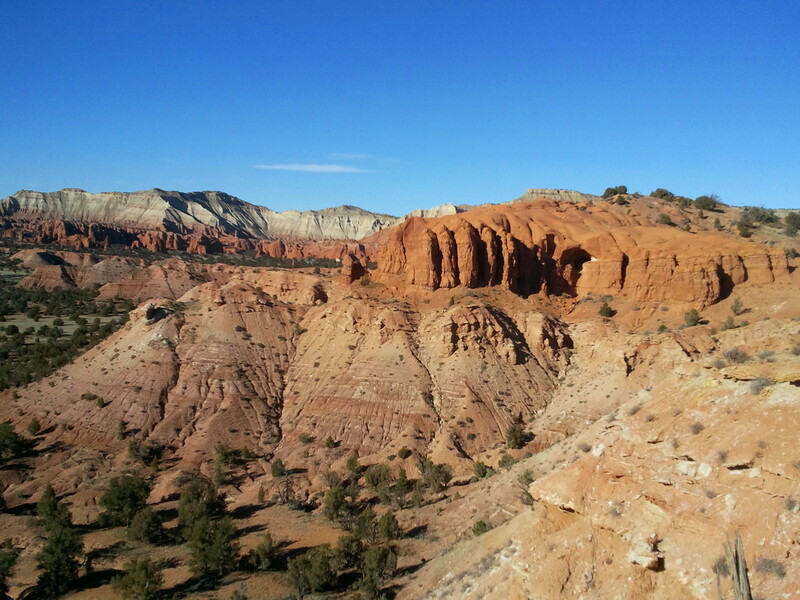 Try one of Kodachrome Basin’s four other established trails, including the classic Panorama Trail or intriguing Grand Parade Loop. This entry was posted in Kodachrome Basin State Park, Moderate Hikes, Utah and tagged arch, Carmel formation, Entrada sandstone, Grand Staircase, Grand Staircase-Escalante, gypsum, Kodachrome Basin, loop hike, sedimentary pipes, Sentinel, Shakespeare Arch, Shakespeare Arch and Sentinel Trail, slickrock cut-off, spire, Utah. Bookmark the permalink.